Start your engines. 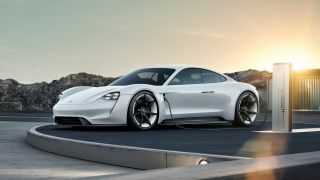 Moving from concept to production next year, Porsche has announced the official name for the vehicle that has been known as Mission E until now. The Porsche Taycan, which roughly translates a “lively young horse” is a reference to the horse image present at the center of the Porsche crest. The Taycan features two permanently excited synchronous motors (PSM) with a system output of over 600 hp (440 kW) that accelerate to 100 km/h in well under 3.5 seconds and to 200 km/h in under twelve seconds. It's maximum range is over 500 kilometers allowing to drive it from Abu Dhabi to Muscat on a single charge. “Our new electric sports car is strong and dependable; it’s a vehicle that can consistently cover long distances and that epitomises freedom”, said Oliver Blume, Chairman of the Executive Board of Porsche AG. A dedicated assembly area for the Taycan and a conveyor bridge for transporting the drive units to the final assembly area is currently being constructed. The existing engine plant is being expanded to manufacture electric drives.